Get ready for a unique lift-served ski adventure! Guided skiing and snowboarding at Silverton Mountain is similar to heli-skiing, snow cat skiing, and resort skiing, but really unlike anything else in the country. You will be accessing up to 1,819 acres of backcountry type terrain via chairlift, without the big crowds signature to other ski areas.There are no groomed runs and no cut trails, just loads of nature’s finest black diamond skiing in the U.S.A. During an average guided skiing day, you can expect to get in anywhere from 3-6 runs (roughly 10,000+ vertical) of some of the best terrain in the world. While we cannot guarantee top to bottom powder skiing, the snow quality is typically very good. Each guided skiing group of approximately eight people can expect to hike anywhere from 5 minutes to an hour for each run, although you can also drop straight from the lift. Hiking 15 minutes to an hour allows access to large open bowls and steep, tight chutes. Often during heavy snowfall, we ride primarily in the trees. After each run you will return to the lift by shuttle or foot. Walking for 10 minutes to return to the lift is possible. Please be aware that if you are significantly holding up the rest of your group hiking or skiing, we may try to move you to a slower paced group. If it is determined your fatigue or skill level becomes a safety hazard to yourself or others, you may be asked by your guide to sit out the rest of the day without refund. If you are unhappy with your group please inform your guide. We meet at the Silverton Mountain base area promptly at 8:20am for check-in, a safety talk, and riding. Be sure to arrive at 8:15 if you are renting gear. Groups are formed at the start of each day, so there is no need to inform us ahead of time who you’d like to ski with. Groups are created according to self-assessed skill levels (fast, medium, slower) and by grouping of friends. Arriving early will not get you on the mountain sooner, however, if you arrive late you might miss the first run and may end up with little choice in terms of grouping. You will be able to connect with a group for the following run. If your group arrives late, we will try to keep you together, but we may have to split the group up. If you have reserved a private guide, this does not apply. Guided Only Skiing— $179. See our pricing page more more info. If you want a heli drop or want to upgrade to a 6 Run Heli Day, ask your guide! Book your trip to Silverton online! Want to avoid skiing with strangers and have a more intimate experience with one of our expert guides? Book a private and go big or go slow. It’s your day. Please feel free to call the office in order to book your Private Guide experience (970) 387-5706. New terrain opens almost every day after additional avalanche work. Many times the freshest snow may be on Thursdays, but over the weekend more terrain typically opens each day so you will usually find the most terrain options on Sundays. This means fresh powder is usually available every day of the week regardless of when the last snow fell. Prepare for the high altitude. Check with your physician first before taking any medications. You can start taking Diamox one day before you arrive for best results (RX. We are told that the recommended dose is 125mg twice a day, but check with your Doctor) or Ginseng 100 mg twice a day starting 5 days before you get here. If you are coming from sea level, skiing an easy partial day before your Silverton day will help with the altitude. Most importantly, remember to stay hydrated by drinking plenty of water. Relax! There is no mad dash to ski it up as fast as possible like at a regular ski area. The nice thing about Silverton is the snow will still be there, so relax and enjoy your day. Guided skiing moves at a different pace than at a hectic ski resort with high speed lifts and agro attitudes. 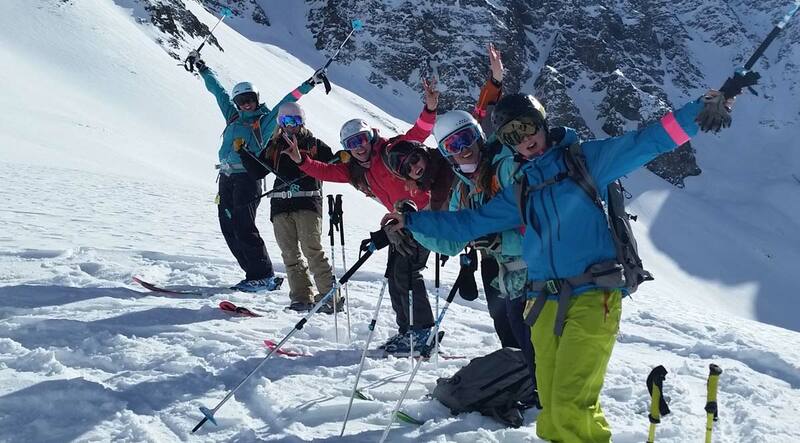 Most groups ski 4-5 runs a day (8,000-12,000 feet of vert) and are completely worn out. But if you want to ski as much vert as humanly possible by skipping lunch, snacks, and bathroom breaks and sprinting instead of hiking, let your guide know and they will try to accommodate you. If there has been a big dump or change in winds recently, don’t expect to be skiing big, steep lines as it can take a while to get these runs open. Tree skiing is more common after fresh snowfall. We will try to get the best runs open further out on the ridge as quickly as possible, so we may hike right past runs with fresh snow and blast holes to get to more distant terrain. Many times we will start to blast a run, only to learn that it needs more time before we can open it. Skier compaction allows us to keep the mountain open. Please feel free to ask your guide what that means. Our snowpack is unlike any other so please have patience, stability assessment always takes a bit longer in the San Juan Mountains. If you are of an exceptional fitness level, and want to ski the steepest, most rocky, 6 foot wide chutes all day at a frantic pace, try to bring your own group of 8 skiers. Eight is the magic number for getting your own guided group. If you are a returning guest and want to request a guide, feel free to do so when you arrive. The mornings are hectic so please make your request more than once. Private guides are also a great option. Most people enjoy skiing the regular steeps of Silverton with standard groups at a regular pace. But we know there are some (about 2%) who aren’t happy unless they are going as big as possible all day. To best accommodate the needs of insane skiers follow the above tips. Pay attention to your guide all day, do exactly as you are told. The guide will only take you where he/she feels comfortable as your safety is their priority. The better you listen, the more the guide can open it up for you with longer pitches, steeper lines, etc. Let your guide know if you want to huck your meat or ride steeps as much as possible. If you don’t tell them, they won’t know. The guide may not be able to accommodate your request based on snow conditions and avalanche hazard, but they will try their best.